Immersed in the American West during the early 19th century, artist George Catlin made it his goal to capture idyllic scenes of nature, often featuring the frontier’s many Native American inhabitants. Catlin was concerned about the destruction white settlers would bring as they moved west from the urbanized East Coast, reshaping the landscape for agricultural and industrial uses, and he wanted to document scenes of indigenous life before it was forever altered. His artwork captures vibrant green vistas filled with Native Americans playing games, dancing, and performing religious rituals, or hunters chasing buffalo and taming wild horses. Within a few decades, concerns about the loss of our natural landscape would reach the highest levels of America’s government, and efforts to preserve this open space would begin gaining traction, starting with the preservation of Yosemite in 1864. Eventually, these lands would become the basis for our National Park system, a model that has since spread all over the world. And yet, the National Parks differed from Catlin’s earlier mission in an important way—they attempted to eradicate native inhabitants, rather than protect them. Today, the foundational myth of America’s National Parks revolves around the heroic preservation of “pristine wilderness,” places supposedly devoid of human inhabitants that were saved in an unaltered state for future generations. This is obviously a falsehood: Places like Yosemite were already home to thriving communities that had long cherished—and changed—the environment around them. Catlin’s paintings are vivid reminders that the vast expanses of our western frontier were not empty, but rather brimming with human cultures. Though the National Park Service prevented wholesale industrialization, they still packaged the wilderness for consumption, creating a scenic, pre-historical fantasy surrounded by roads and tourist accommodations, all designed to mask the violence inherent to these parks’ creation. More than a century later, the United States has done little to acknowledge the government-led genocide of native populations, as well as the continued hardships they face because of the many bad-faith treaties enacted by the U.S. government. This story is an elemental part of our National Park system, the great outdoor museum of the American landscape, but the myth continues to outweigh the truth. How did the National Park Service evict Yosemite’s indigenous communities and erase their history, and can it come to terms with this troubling legacy today? 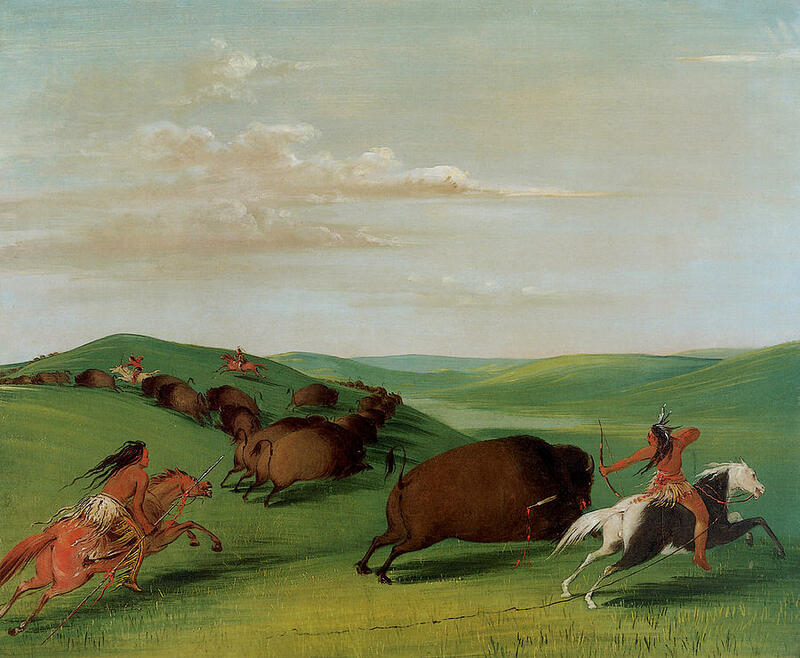 Top: “Buffalo Chase with Bows and Lances” painted by George Catlin, 1832-1833. Via the Smithsonian American Art Museum. 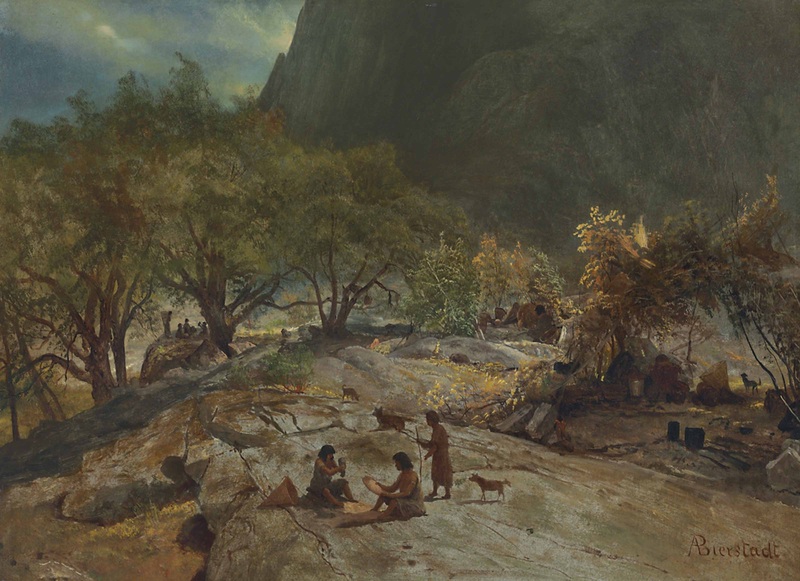 Above: “Mariposa Indian Encampment, Yosemite Valley, California” by Albert Bierstadt, 1872. As author Mark David Spence points out, while Catlin was one of few Americans to propose protecting indigenous people, his imagined park would still have exploited native cultures. “Catlin’s vision of ‘classic’ Indians grossly ignored the cultural dynamism of native societies, and his park would have created a monstrous combination of outdoor museum, human zoo, and wild animal park,” Spence writes in Dispossessing the Wilderness: Indian Removal and the Making of the National Parks. Catlin’s ideas did eventually seep into the mainstream, and Native Americans would later be put on display like animals in a zoo. But first, “uninhabited wilderness had to be created before it could be preserved,” Spence notes. 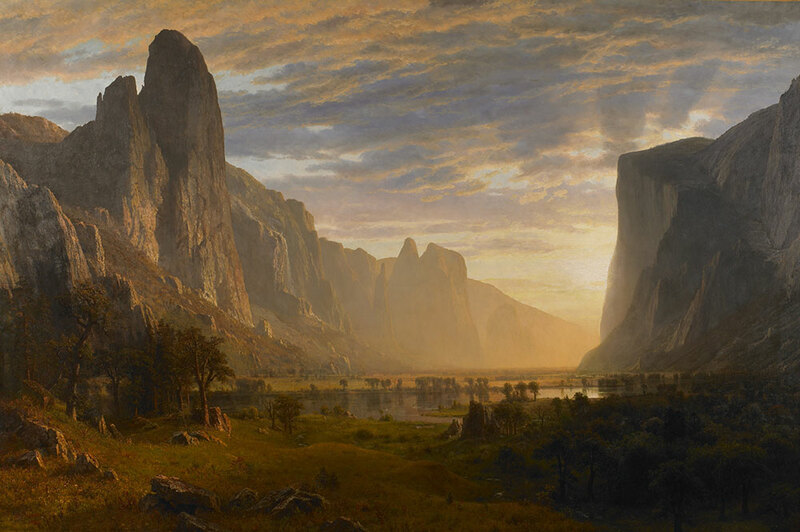 As Native American populations were murdered under the cover of Manifest Destiny, the idea of wilderness was twisted to mean a place before people, an idealized natural landscape that ignored the actual history of these magnificent places. Despite the obvious claims of indigenous peoples to their lands, white officials frequently justified their removal by claiming that Native Americans weren’t good stewards of the new American frontier. In its excellent exhibition, “Nation to Nation: Treaties Between the United States and American Indian Nations,” the National Museum of the American Indian points out the myriad ways the United States government repeatedly lied about, altered, and disregarded legal contracts intended to secure native access to the land they already lived on. Beyond this egregious, criminal behavior on the part of U.S. officials, they also relied on written documentation, disadvantaging tribal officials who were accustomed to oral agreements or not fluent in English. Sometimes contracts were even negotiated by individuals that had no power to speak for their larger native community. 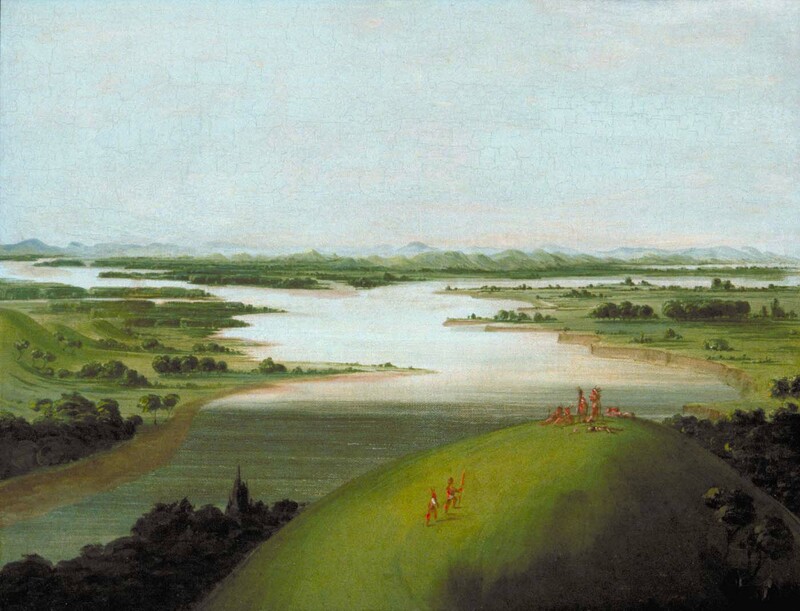 “Mouth of the Platte River, 900 Miles above St. Louis,” by George Catlin, 1832. Via the Smithsonian American Art Museum. Indigenous Americans eventually began referring to such treaties as “bad paper” because they learned the written contracts of European Americans were untrustworthy. But it wasn’t simply about miscommunication: Ultimately, the dispossession and genocide of native people was driven by white-supremacy, the idea that a “superior” civilization knew better how to utilize America’s vast land, and in particular, how to profit from it. 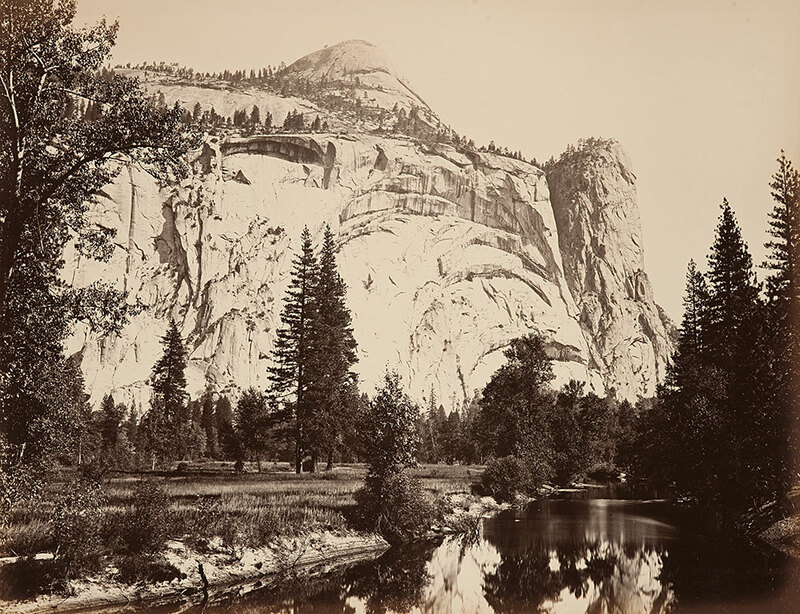 Early images of Yosemite Valley, like this photograph by Carleton E. Watkins from 1861, capture a landscape that was cultivated by Native American inhabitants for thousands of years. Via the California State Library. As the settlement of the western United States continued apace, Native Americans were systematically killed, enslaved, or pushed onto isolated and undesirable land by European Americans, who were privatizing most native land for profit. Support for excluding indigenous people from their homelands was also promoted by famous naturalists like John Muir, who held blatantly racist views about Native Americans. Muir and his cohorts never acknowledged that places like Yosemite, revered by European American visitors for its awe-inspiring “natural” appearance, had been shaped by centuries of native inhabitants who utilized controlled burning, horticulture, and other techniques to manage the ecosystem they depended on. 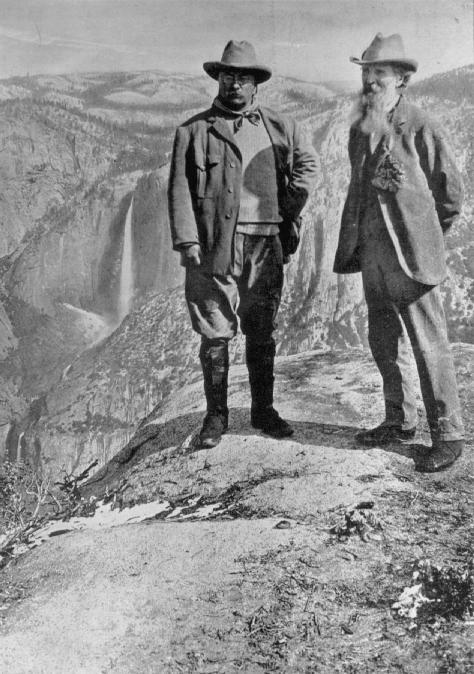 President Theodore Roosevelt and naturalist John Muir at Glacier Point in Yosemite, 1903. Muir’s views on conservation and Native American removal influenced the highest level of federal politics. Via the Sierra Club. By the mid-19th century, American politicians were engaged in a debate over the preservation of our country’s natural wonders. Interest in outdoor recreation was on the rise, along with a nationalist pride in the country’s monumental landscapes. Yet many significant sites in the East, like Niagara Falls, had already been tarnished with industrial development, so the nation’s political leadership hoped new parks would be protected from too much human intervention. While nearly every region destined to become a National Park was originally home to indigenous communities, the history of Yosemite clearly illustrates our government’s unjust treatment of the native people who called these spaces home. Several culturally distinct groups had inhabited the area over the last millennia, but by the mid-19th century, the Southern Sierra Miwok (and a subset known as the Ahwahneechee) were the most visible presence in Yosemite Valley, living alongside members of the Northern Paiute and Mono people. When the Yosemite Valley was first preserved for public use by President Lincoln in 1864 (giving the property to the state of California), much of the local indigenous community had already been devastated by a state militia group, the Mariposa Battalion, as a part of what is today known as the Mariposa War. 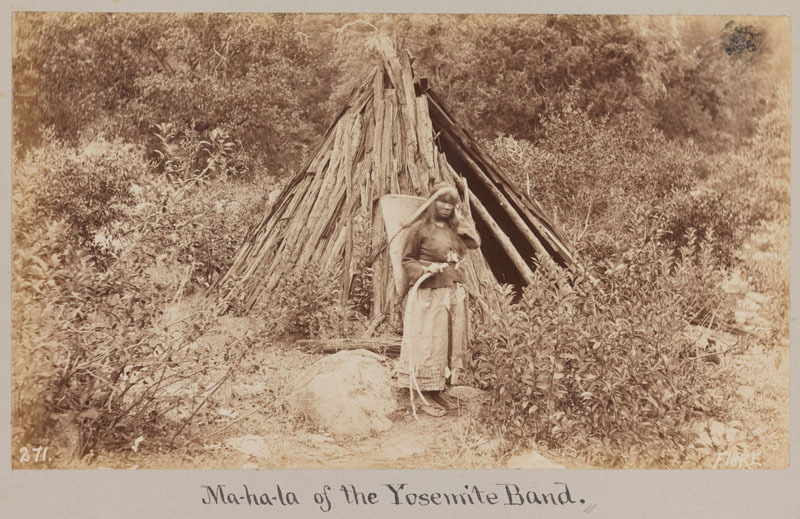 “Ma-ha-la of the Yosemite Band,” photographed by George Fiske, circa 1885. Via the California State Library. After gold-mining camps steadily encroached into Native American lands along the Sierra Nevada mountains, several groups had fought back by raiding the Fresno River outpost of James Savage. In response, Savage organized a local militia group that chased the indigenous groups into the mountains and forced them into battle until the tribes surrendered. Surviving tribal members were forced to leave the region and move onto reservation land along the San Joaquin River in the Central Valley, though some hid in the mountains, hoping to return to their home. “It was just a big mess,” Tony Brochini, a descendant of the Southern Sierra Miwok, says. “But that’s why we say that we never left Yosemite Valley.” Brochini, who was born and raised in Yosemite and worked for the National Park Service for 38 years, has long been involved with efforts by groups like the Wahhoga Committee, an organization of the area’s seven affiliated tribes, to re-establish indigenous cultural spaces within the park. Like dozens of other California tribes, despite their well-documented legacy, the Southern Sierra Miwok are still not federally recognized. Left, a gathering at the Coulter and Murphy Hotel in Yosemite Valley celebrating the opening of Mariposa Road, 1875. Via the Mariposa County Library. 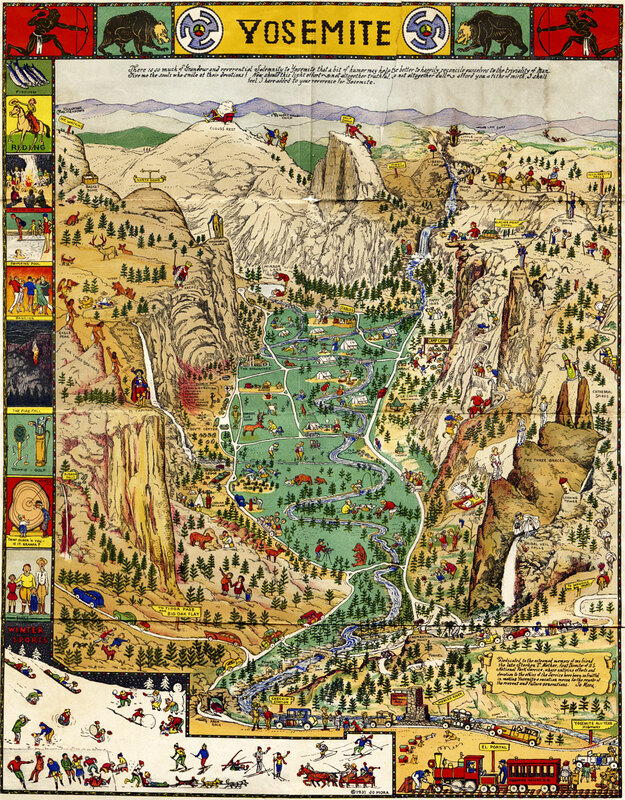 Right, the cover of a tourist map to Yosemite, circa mid-19th century. The first year after its public designation in 1864, Yosemite only saw 147 visitors, though the numbers quickly multiplied as better rail access and tourist accommodations were established. (Although Yosemite was open for visitors in the 1860s, Yellowstone technically became the United States’ first National Park in 1872, with Yosemite following in 1890. Yosemite Valley and Mariposa Grove remained under state control until 1906, when they joined the rest of the park under federal jurisdiction.) 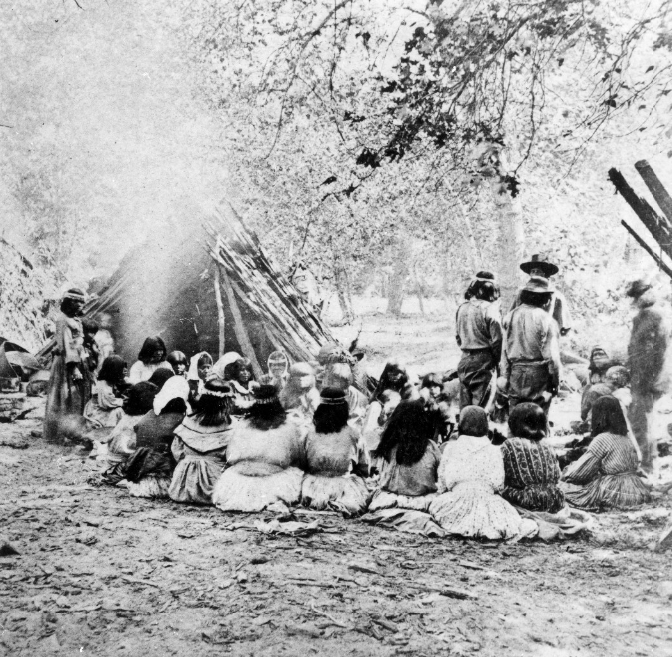 Indigenous residents quickly assimilated to a growing community of white residents working for the Yosemite Valley’s various tourism operations by adopting European American clothing, food, and homes. 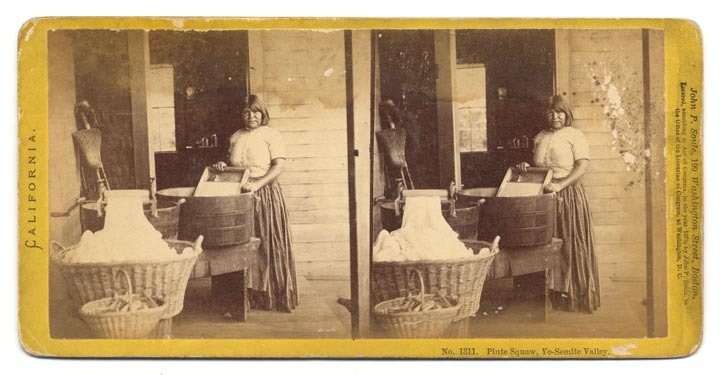 A stereoview of a Paiute woman doing laundry in the Yosemite Valley. Photo by John P. Soule, 1870. Via the California State Library. During the 1910s and ’20s, Yosemite hosted popular Field Days where white visitors could dress in stereotypical garb and indigenous employees were encouraged to act out white conceptions of native life. “Yosemite Park and Curry Company would dress up the Indians in the village with Midwestern headdresses and costumes and parade them around on horses,” Brochini says. “It was a big production, almost like a Barnum & Bailey sideshow.” These events stood in contrast to the indigenous community’s annual gathering known as the Big Time, a tradition centered on food and dance. 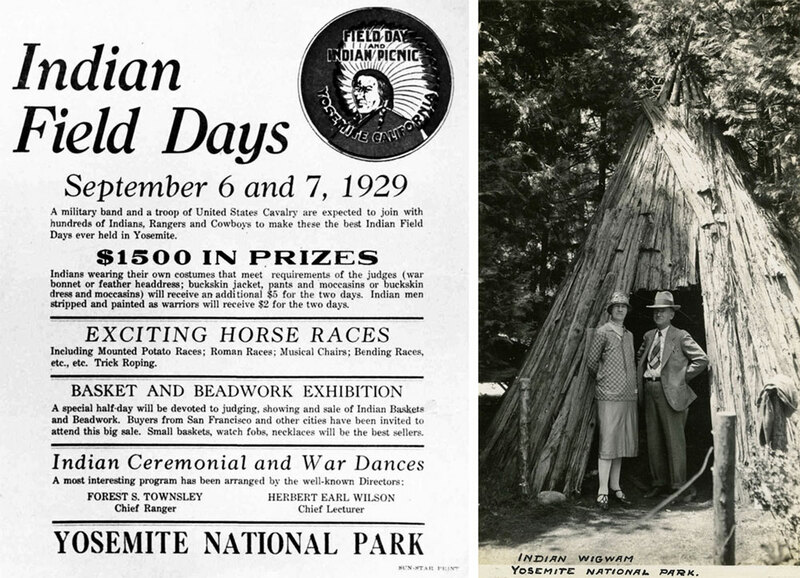 Left, a poster advertising Yosemite’s Indian Field Days in 1929. Right, tourists Grace and William McCarthy pose in front of a Miwok u’macha at Yosemite, 1935. Via the William M. McCarthy Photograph Collection, California State Archives. In 1917, not long after the National Park Service was formally established, Secretary of the Interior Franklin Lane described it as a “national playground system,” emphasizing that these lands should be altered and developed to make them more accessible to the public, whether by cutting trees, building roads, or killing predators to increase popular game animals. Even as park officials sought to utilize the indigenous population as an “exotic” attraction for tourists, they simultaneously limited the use of park space for traditional tribal activities, including seasonal burns used to maintain open prairies and manage plant growth. Native American residents who broke park rules were subjected to particularly severe punishments, including lengthy jail sentences or expulsion from their homes in Yosemite. Unless under explicit supervision, park officials preferred to keep native residents out of sight. Indigenous survivors of the Mariposa Battalion had first resettled in the Indian Canyon area and remained there until the late 1920s, when park officials requested the native population move to a new location. This was ostensibly due to substandard living conditions, but more likely because the National Park Service planned to build a medical clinic on the existing village site. Brochini says his tribe’s matriarchs made the decision to move to an area they referred to as the “New Village,” where an ancient settlement called Wahhoga had once been. On the Yosemite website today, the park service says that the Indian Canyon settlement was “disbanded,” rather than forcibly moved, and passively describes the indigenous community as shrinking. As is common on interpretive material regarding Native Americans, the National Park Service’s pressure on indigenous people to relinquish access to their land is masked by a blameless narrative of “natural” population decline and economic shifts. By the 1930s, the governing view of Yosemite’s ecology was changing again: Park management began a push to restore the park to its so-called “pristine state” by managing wildlife and focusing on tastefully modified natural scenery, instead of increasing development of tourist facilities and roads. These goals reinforced official moves to restrict the indigenous population’s use of Yosemite’s natural resources, whether for hunting or sourcing plant foods, gathering materials for traditional crafts, or burning fires. 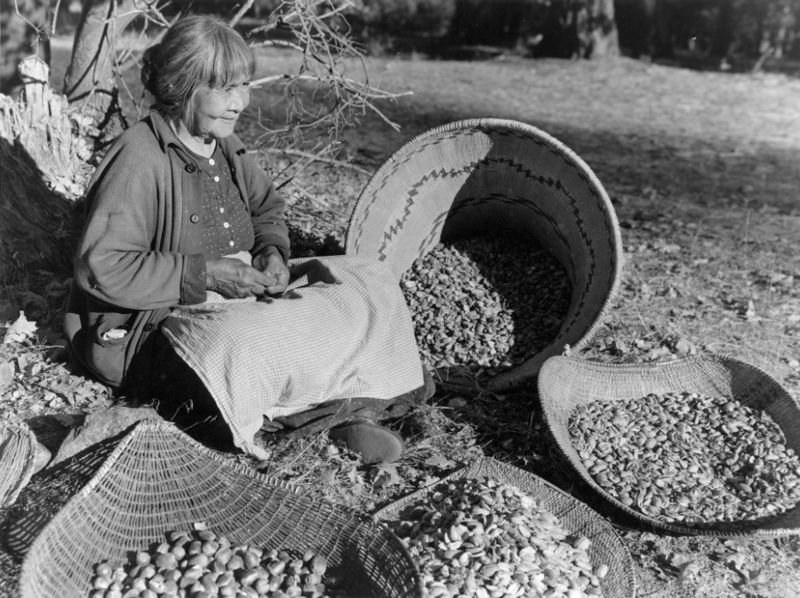 Maggie Howard, known as Tabuce, preparing acorns in Yosemite. Photograph by Ralph Anderson, 1936. Via the Mariposa County Library. The National Park Service’s “Mission 66” initiative led to a mini-development boom to accommodate hordes of tourist traffic, as seen in this Rondal Partridge photograph of Yosemite, entitled “Pave It and Paint It Green,” circa mid-60s. Via the Library of Congress. Even decades later, the park service is not forthcoming about its eviction Yosemite’s native population. 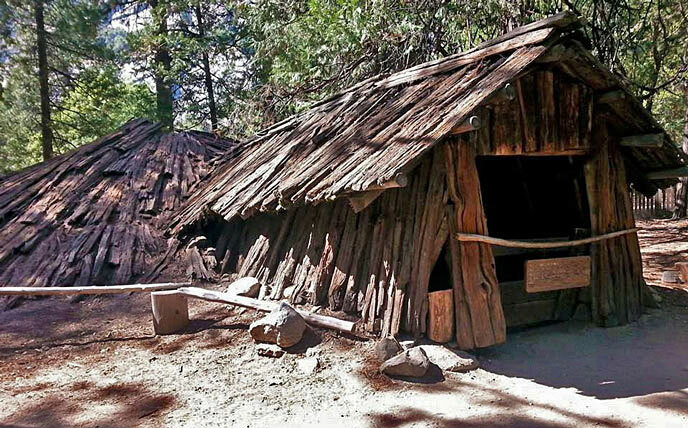 “With housing more difficult to obtain, fewer Indian people came to Yosemite for employment,” the Yosemite website explains, conveniently sidestepping the park’s longstanding campaign to force Native Americans out of Yosemite Valley. A Native American gathering near a cedar-bark u’macha near the Merced River in the Yosemite Valley. Photo taken by Eadweard Muybridge, 1872. Via the Yosemite Museum, National Park Service. “They didn’t want to share the stewardship,” Brochini says. “They didn’t want to deal with the Indian people and their living conditions, and having to talk about the history of atrocities in Yosemite or other parks, because I think in all the National Parks at some point in time, there was either militia or a battalion that went in and tried to remove people. The Park Service didn’t want indigenous people to tell the public about how they were being treated, and that’s basically what it all comes down to.” By 1969, only a few cabins remained in Yosemite’s Indian Village area, and officials relocated the remaining residents to government housing for park employees, using their empty cabins for firefighter training exercises. The ceremonial roundhouse at the Yosemite Museum’s reconstructed Indian Village dates from 1992. Via the National Park Service. Following the closure of Yosemite’s Indian Village in 1969, descendants from the Southern Sierra Miwok organized the American Indian Council of Mariposa County (AICMC) to advocate for themselves and strengthen the ties of their scattered community. 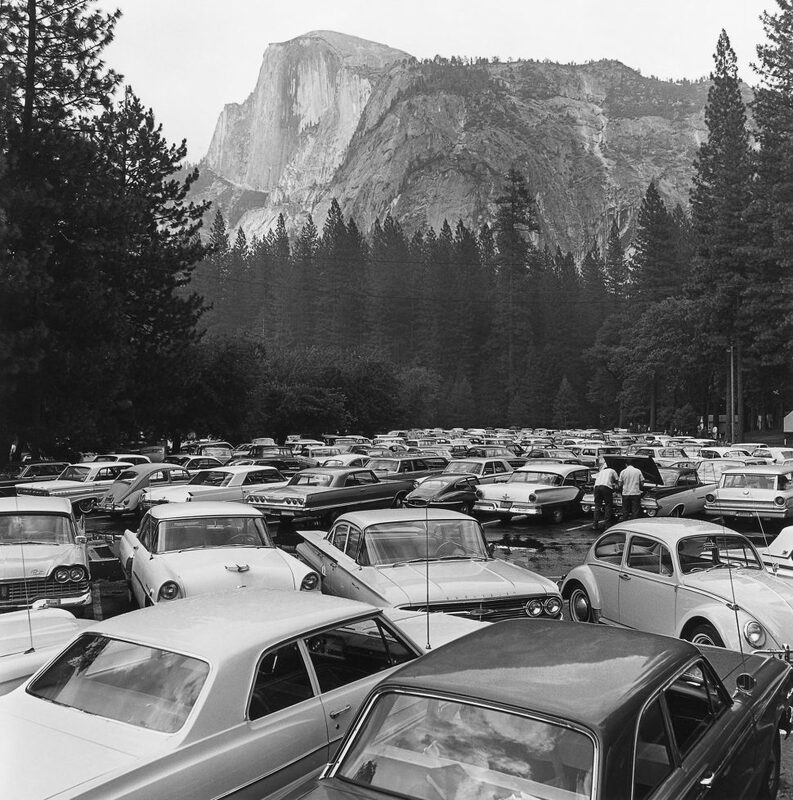 During the 1970s, AICMC renewed the fight for access to Yosemite parkland where they could hunt and gather plants in a sustainable way and establish a cultural center as part of the park’s new General Master Plan. 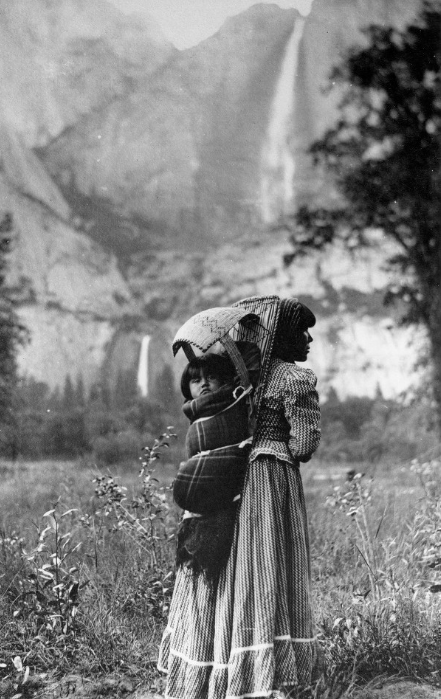 Suzie McGowan carrying her daughter, Sadie, in Yosemite Valley, as photographed by J.T. Boysen, 1901. Via the San Joaquin Valley Library System. “Two of our tribal elders—Jay Johnson and Les James—stood up to this group of congressmen and superintendents that came to create the General Master Plan,” Brochini explains. “The way Jay tells it, he says they couldn’t believe what they were hearing, Indians asking for their last village back.” After considerable discussion, the framework for a new cultural center on the former Indian Village site made it into Yosemite’s 1980 Master Plan. In 1987, the National Park Service produced its first Native American Relationships Management Policy, which committed to actively promoting tribal cultures as an important component of the parks. While the new cultural center is constructed, Yosemite staff is also working to improve the bias present in the outdated historical materials posted throughout the park, as they opportunistically refurbish different areas. “One thing I’m really proud of is a huge restoration project at the Mariposa Grove of Giant Sequoias,” Gediman says. “I love to call it an ‘undevelopment project.’ That’s an area where there was a parking lot in the middle of the giant Sequoias—it was just very commercialized. We’ve removed the parking lot, the tram, and the gift shop. It’s going to reopen this spring, and on the new interpretive panels or displays, we talk a lot about the cavalry, Galen Clark, the military history, and the ‘white man’s version’ of history. 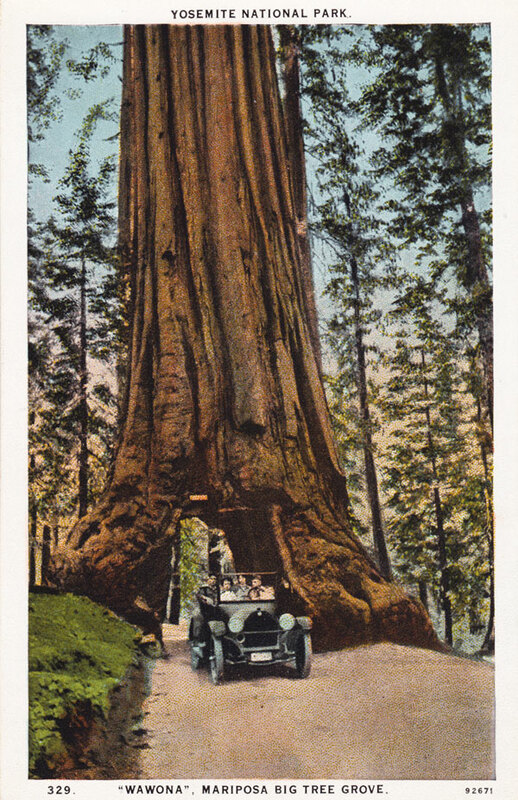 A postcard view of the famous Wawona Tunnel Tree in Yosemite’s Mariposa Grove. Cut as a tourist attraction in 1881, the tree collapsed in 1969, and is emblematic of Yosemite’s destructive development. Via Postcard Roundup. Some of this progress was derailed by former superintendent Don Neubacher, who stepped down in 2016 after several years on the job amid a federal investigation into his “hostile” work environment. Despite this setback, Yosemite officials seem increasingly open to allowing indigenous access, such as the free permits issued to affiliated tribal members for gathering plants and using parklands for traditional ceremonies, like the annual walk across the Sierra to honor their ancestors. However, the growing number of visitors to Yosemite and structures needed to accommodate them continue to intrude into traditional indigenous ways of life. 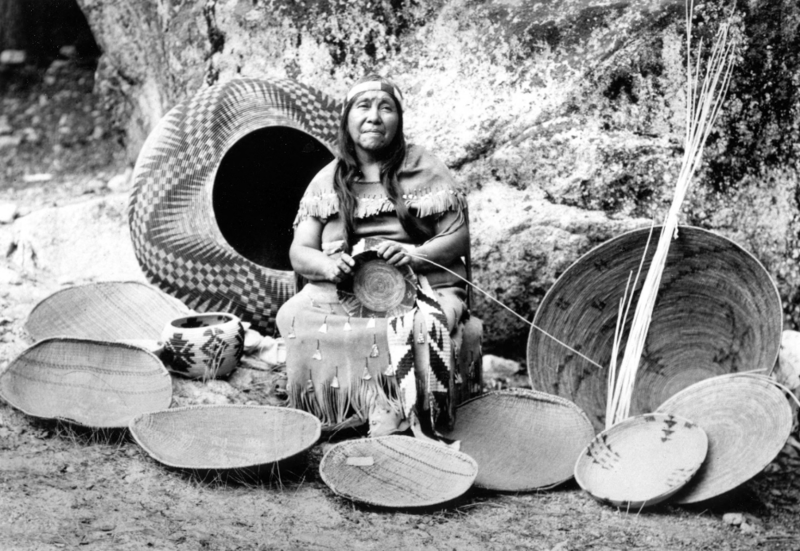 Lucy Telles with her baskets in Yosemite National Park, circa 1940s. Via the Yosemite Museum, National Park Service. Meanwhile, new experiments in shared stewardship between the federal government and indigenous communities are ongoing. In 2015, the Hopi, Navajo, Ute Mountain Ute, Ute Indian, and Pueblo of Zuni formed the Bears Ears Inter-Tribal Coalition to advocate for the creation of a new national monument in Utah. The following year, President Obama created the Bears Ears National Monument, along with a unique provision that the land be managed jointly by the Bureau of Land Management and the U.S. Forest Service, with input from a new commission, which includes a representative from each of the five tribes. Though Interior Secretary Ryan Zinke and President Trump have since attempted to pare down the size of Bears Ears, local tribes and conservation groups have filed lawsuits to block this encroachment. The museum touches on the arrival of Lafayette Bunnell, James Savage, and the Mariposa Battalion, and the violent beginnings of Native American removal. But park employees like Gediman know there is room to improve, as the recognition of indigenous struggles to maintain a connection to their homeland is mostly lacking. “These are the kinds of things that the National Park Service can’t just gloss over,” Gediman says. 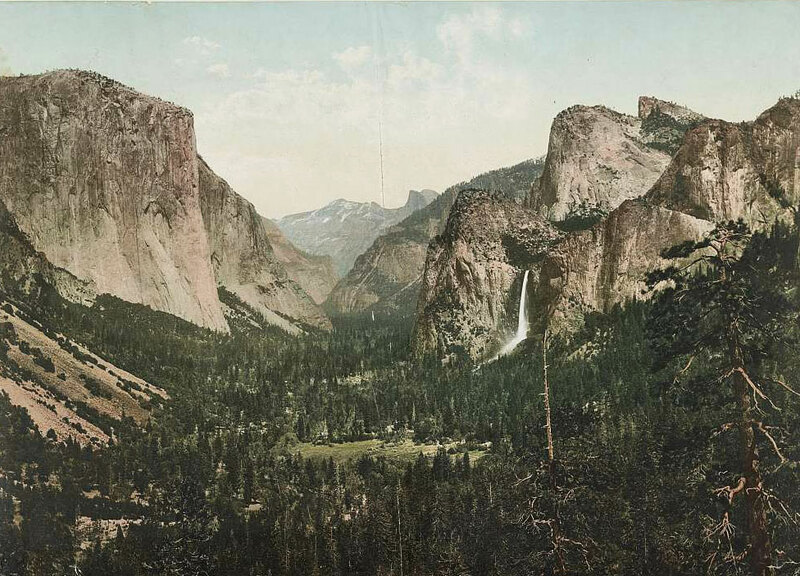 “Yosemite Valley from Artists’ Point” photochrom print by William Henry Jackson, circa 1898. Via the Library of Congress. There is no greater discrimination than that against Native Americans, Lone Wolf vs Hitchcock must be over-turned. They were here first, we are guests and very poor guest at best. This is an important story and reminder of how much is yet to be done in honoring all American stories in our national parks, including our wrongs in places like Manzanar and myriad African and Native American sites of significance. It’s encouraging to see improvements and efforts on many fronts and I wish those efforts were acknowledged a bit more here. To see Jay Johnson and his son Phil use cultural practices to start management fires in Yosemite alongside today’s firefighters is inspiring. Perhaps the article could have linked to this video of that effort. https://www.nps.gov/media/video/view.htm?id=FCAB873A-03DC-D9A3-1F2FECA2217E4BAF The visitor center’s graphic large-scale depiction of the Mariposa Battalion burning tribal structures would also be a welcome addition to the article. While calling out the deficiencies and making a call to action we should also fully acknowledge the progress made to inspire more of it. Acknowledging and addressing more recent 20th Century Native American history, as we have done with racism related to black history for example, is a necessary next step. Just as Shelton Johnson cannot be the sole voice for black history in Yosemite, neither can Ben and Kimberly or Phillip and Julia be that for native people. The exhibits, films, waysides and more, developed in partnership and mutual respect, are a best practice to amplify. To quote Pete Seeger…”when will we ever learn, when will we ever learn”. History would seem to indicate that we don’t learn, and if we do it is inevitably lost and forgotten. it is what we do as a species. we kill and destroy. and we will continue to kill and destroy until there is none of us left. so, at least there’s a happy ending. This is a very timely article and well done. My own Anglo American family has 8mm, video only family films from the late 1950’s/early 1960’s. In one of those, we have traveled from Texas to one of the national parks. I am 8 to 11 years old, dressed in a full on feathered head dress, and dancing in a circle with some of the Native Americans (obviously hired) in the national park we were visiting. I remember to this day how embarrassed and self conscious I was, but somehow, I found myself doing such. The photograph of Ms. Suzie McCowan with her daughter, Sadie, is wonderful; I think I see what may be a weather shade of some kind above Sadie’s head. Excellent article!!! Keep up the great work, Hunter! The article cites, the Southern Sierra Miwok (and a subset known as the Ahwahneechee, WRONG, the Ahwahneechee were Mono Lake Paiutes ! “ ” For people who are social animals, the mobile-home park is a great place to live.